The following is a speech given by Nonie Darwish, the founder of Arabs for Israel, at an event at UC Berkeley for Islamo-Fascism Awareness Week which took place on college campuses around the U.S.
Darwish is an Arab Muslim from Egypt. Her father was a terrorist martyred in the cause. Her speech (below) is preceded by a short intro written by her regarding her impressions of the events surrounding the speech. The atmosphere required extensive security — which made me feel that without it I would have been physically hurt at UC Berkeley. The first statement from the Al-Jazeera representative to me was: “You are the most hated woman in the Arab world.” The hatred was also felt from the far leftist American audience. My response to the Al-Jazeera statement was: “Arab media spread a hate campaign against me after my book came out. Egyptian media, without reading the book, called me a traitor to my father because I support Israel. I love my father and I believe that if he had lived he would have been part of the peace treaty that Sadat had signed with Israel.” I believe the Arab media is trying to misrepresent my views in order to silence me. A man was sitting in the audience with a black sheer bag covering his head to protest ‘Abu Greib’ when the discussion had nothing to do with Iraq. There were screams from the audience: "Fascist," then "racist" then "Osama Bin Laden is a CIA agent." The noise was getting louder and I could not speak any more. I felt that even in America I am being silenced. The sad thing about this whole event was the feeling that radical Muslims and their far Left supporters would rather never criticize Islamic culture than stand up against the culture that flogs, stones, beheads and amputates limbs. Not offending a religion has become more important to the far Left (unless it is Christianity or Judaism) than human rights of Muslims and victims of terror. Honor killings and female genital mutilation can be tolerated — but noone better dare utter the word "Islamo-fascism." American universities are becoming tyrannical when it comes to conservative values and to Arab Americans who dare to speak out against the culture of jihad. It does not matter how many people in my early life in Egypt suffered from honor killings, female genital mutilation and oppression of women, I must shut up on American campuses. As an American woman of Muslim Arab origin, I cherish the freedoms America has given me; a right all too scarce in the Middle East where speaking for human rights, women’s rights, democracy and even peace with Israel, is a taboo with serious consequences. In America, I learned that no ideology or religion is beyond questioning. Ideologies that don’t answer the hard questions will face intellectual bankruptcy. I would like to stress that this is not a discussion about the good and peace loving Muslims, but about an ideology of violence and hatred that has brought oppression, unrest, violence and terror to the Middle East and has now spread to the rest of the world. Radicals have made the slightest criticism, critical thinking and free inquiry an insult to Islam. Arab feminists, reformers and intellectuals are intimidated, threatened or killed. Even the late Egyptian novelist Naguib Mahfouz, winner of the Nobel Prize in Literature, was stabbed in Cairo in 1994 by a radical Muslim who claimed he insulted Islam. That is why we all must welcome an open discussion. The best weapon in the war on terror and Islamo-Fascism is the truth. I’d like to start with my background. I was born and raised as a Muslim in Cairo, Egypt and the Gaza Strip; a time when President Nasser was committed to unifying the Arab world and destroying Israel. In the 50’s, my father headed the Egyptian military intelligence in Gaza and started the Fedayeen, which means "armed resistance and self sacrifice." They made cross-border attacks into Israel and caused death, damage and destruction. There were assassination attempts on my father in response to the terror. One night Israel sent commandos to our heavily guarded home, but my father was not home. All the Israeli soldiers found were us, women and children. The Israeli soldiers left us unharmed. I attended Gaza elementary schools. It is there that we learned hatred, vengeance, and retaliation; peace was never an option; but a sign of defeat and weakness. Jews were portrayed as less than human. I was told "don’t take candy or fruit from a stranger, it could be a Jew trying to poison you." They filled our ears with fear of Jews. That made hatred come easy and terrorism acceptable, even honorable. After two years of intense Fedayeen operations, my father was killed in the first targeted assassination in Gaza in 1956. I was 8 years old. In Nasser's famous speech to nationalize the Suez Canal, he hailed my father as a national hero, a Shahid. President Nasser vowed that all of Egypt would take revenge and made no mention of the heavy toll of death and destruction brought upon Israel by the Fedayeen. My siblings and I were asked by top government officials "which one of you will avenge your father's blood by killing Jews?" I felt very uncomfortable with the question. We were speechless. After my father’s death, my mother had to face life alone with five children in a culture that gave respect only to families headed by a man. In the 50’s few women drove cars and she was criticized and called names for buying a car to take us to school. Arab women are expected to sacrifice their family by giving up their husbands and sons to martyrdom, but are given little respect to live their life with freedom and dignity. I lived for 30 years in oppressive dictatorships and police states. I witnessed honor killings of girls (our maid), oppression of women, and female genital mutilation. We regularly heard non-Muslims cursed from the pulpits of mosques. As a young woman, I visited a Christian friend in Cairo during the Friday prayers, and we both heard the verbal attacks on Christians and Jews from the loudspeakers. We heard "May God destroy the infidels and the Jews, the enemies of God. We are not to befriend them or make treaties with them." We also heard the worshipers respond "Amen." I heard "cursing prayers" all my life from the pulpits of mosques — and believe it or not, if you grow up with cursing prayers, it can feel and sound normal. My Christian friend looked scared, and I was ashamed. That was when I first realized that something was very wrong in the way my religion was taught and practiced. I moved to the U.S. in 1978. On my first visit to a mosque in America, we were told not to assimilate in America and that Islam is here to become the dominant religion. I was told to cover up in Islamic clothes. But how could I do that when I never wore Islamic clothes in Egypt? Women in Egypt until the 1980’s did not wear Islamic clothes. In August 2001, I visited my birthplace, Cairo, Egypt. I was stunned to see that radical Islam had taken over. The level of anger and hate speech was alarming. I saw extreme poverty, pollution, hazardous material and garbage along the Nile. There was high unemployment, inflation and widespread corruption. But when I read Arab media, all I saw was Israel and America bashing. Citizens were unaware of Muslim-against-Muslim atrocities in Iraq, Algeria, Sudan, etc. As a matter of fact, the term “Islamo-fascism” was coined by Algerian Muslims and ex-Muslims to describe the Islamic fanatics who slaughtered 150,000 fellow Algerian Muslims in the 1990s. Arab media have failed the human rights of the ordinary Arab citizens. They have no understanding of their role in defending the interest of the public; this mentality was created from an Islamo-Fascist environment that rejects change. Western media was also under-reporting the threat. I was happy to return to the U.S. on the evening of Sept. 10th. 2001. The next morning I saw the second airplane hit the twin towers, I knew "Jihad has come to America." Muhammad Attah was from Cairo, the same city I came from. I called several friends in Cairo, they were all in denial and said, "How dare you say that Arabs did this? Don’t you know this is a Jewish conspiracy?" These were not radicals, but ordinary Egyptians who otherwise are very nice people. I hung up the phone and felt alone and disconnected from my culture of origin. Once again, my people are accusing the Jewish people of something we know very well, we Arabs have done ourselves. In any religion this is considered a sin, but in the eyes of radial Islam, Jews do not deserve the truth, justice or mercy. The Jews that we describe in our mosques, Arab textbooks and media don't exist. We, Arabs are fighting an imaginary Jew of our own creation. Israel is not perfect; no society is; but the way the Jews and minorities are treated by my people is tragic and a disgrace. The global war we are fighting against Islamo-fascism and jihad is not just about bombs and hijacked planes; It’s also about tyranny and oppression of women. Oppression of women and support of terror are two facets of the same fundamentalist mentality. Islamic law — Sharia — that terrorists are fighting to impose upon the world, would create a global state of gender apartheid. Under criminal Sharia, punishment includes flogging, stoning, beheading, and amputation of limbs — cruel and unusual punishment by Western and humane standards. Leaving Islam is punishable by death. If the State fails to kill an apostate, his death is guaranteed at the hands of a street mob. That makes Islam more than a religion; it is a one-party state; and also an elaborate legal system, called Sharia, that can put you to death if you leave Islam. Sharia must guarantee there is no defection from the Berlin Wall of the Muslim State. Amazingly, the majority of Muslim countries don’t practice criminal Sharia because they cannot stomach it. I have lived under Family Sharia for 30 years of my life. This is practiced in all Muslim countries; it allows only men the right to an easy divorce, having up to 4 wives, allows wife beating, half the inheritance of a man to a woman and her testimony in court is only half valid. She is respected only when she shields her body, face, and even her identity. As many as seventy-five percent of women in Pakistani prison are behind bars for the crime of having been raped. Sharia codified into permanent Law a 7th century Arabian Peninsula tribal culture for every Muslim in any culture forever. Under Sharia, the Muslim Khalifa or Amir (meaning leader) is exempt from being punished under Sharia. Islamic Sharia law is a dictator’s dream handed to him by Allah. Polygamy has a devastating effect on family dynamics, husband/wife relationships, and women relationships. Many Muslim men only have one wife, but the damage to the wife/husband relationship has already been done in the Muslim marriage contract itself, where a man does not pledge loyalty to his wife and the wife cannot expect his loyalty. The marriage contract has 3 more spaces to be filled out by other women if the man wishes. A good Muslim woman must accept her destiny under Sharia Law for one simple reason — challenging Allah’s Law is like challenging Allah himself. In the latest Bin Laden tape, the terror guru was calling on Muslims in the West to increase their numbers through converting as many Americans to Islam and through immigration in order to accomplish, what he called, "jihad from within." That is why Islamists in the West are pushing the envelope to see how much the West will tolerate. Some [Muslims living in democracies] demand Sharia Law and even claim that Sharia is comparable with democracy. In a Muslim parade in New York this September, right before the 6th anniversary of 9/11, Muslims carried signs saying “Muslims against Democracy and Western Values," “the Holocaust is a hoax,” and “Ban the Talmud." They were selling books on jihad with an AK-47s on the cover. This comes from people who are complaining of Islamophobia. Do they think this will bring them sympathy and understanding? A Muslim woman in Florida insists on covering her face for a driver’s license, cab drivers in Minnesota refuse to take passengers carrying wine from the duty-free shop, the 6 flying Imams who scared everyone on the airplane are now suing. And lately demands for special faucets at the level of the feet in American schools for Muslim kids to Wada “wash” [Muslim washing ritual] before praying. I have lived in the Middle East for 30 years and have never seen special faucets for Wada in schools or universities, except in mosques. This only exists in Saudi Arabia. The deception is phenomenal. Islamists are pushing Wahhabi Saudi values in America; values that I have never even seen in Egypt. I have not come to America to become a Wahhabi Saudi. Lying to non-Muslims when it is in the best interest of Islam. Lying to Muslims if it will end conflict between them. Lying to one’s wife to improve the relationship. Lying thus has become an obligation in international relationships, Muslim relationships and family relationships. Any wonder why Muslims were silent after 9/11? Those who expose the lying game are considered traitors. By allowing lying, Muslims have created a culture unable to distinguish between lies from truth; truth has become a convoluted game of saving face for the best interest of Islam. The Times of London reported that Muslim students in Britain are being taught to despise non-Muslims as "filth." The Arabic word for this is "nagas." That is why many Arabs believe that the existence of non-Muslims on Muslim land is a desecration or occupation. That is why America’s defense of the Muslims against the Serbs, the Afghani Muslims against the Soviet Union, feeding the Somali Muslims starved by their own leadership, all did not get the U.S. any credit in the Muslim world; just the opposite, the more America tries to help stabilize the region, the more it is despised. Arab-Muslims do not want to be rescued by infidels. This is a proud culture that is easily shamed by feelings of dependency on the non-Muslims. This is the psychology of the Arab Street. That is how the West is perceived. In the Judeo-Christian culture they say: “we are all sinners” — but in the Muslim culture, it is: “they are all sinners; but we are Muslims." Non-Muslim are “Cafir." Non-Muslims are not innocent; they are viewed as sinners who need Islam and Islamists have given themselves the role of Allah to force Islam on the world, against their will, through the principle of jihad. Muslim clergy are constantly looking for the ideal Muslim State and cannot find it. They have failed miserably in stabilizing their society. Instead of being a source of comfort, stability and wisdom, they have become a source of hate, rage, and subversion. To them, the solution is always an intifada, uprising, a coup d’etat, an assassination, or violence on the streets. They have no respect for the legitimacy of any government and no government is Muslim enough for them; not even Saudi Arabia. In this dynamic only tyrannical governments can survive. Leaders who want peace, modernity and reforms are assassinated, like Sadat. 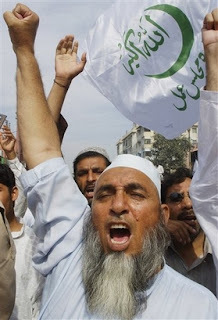 Every Muslim country is suffering from underground radical Muslim groups who are trying to overturn the government and the constitution, in their pursuit for the perfect Muslim state. That is why the Muslim world is in a constant turmoil, stagnation and conflict. Islamo-fascism is the end result. America is very concerned since all of this is spilling over to the rest of the world. In 1998 the same attitude was expressed by a Muslim leader who asked Muslims in America not to assimilate and said we are here to make the Koran the law of the land in America. What Arab leaders are suffering from is now moving to America, and if continues, our freedoms will erode. Islamo-fascist unrest, turmoil, destructive mentality, and hatred of order and the rule of law is now here. If this trend continues Bin Laden’s dreams of internal jihad within America will come true. If that happens America will never be the same again. We could see a large Muslim population congregate in London, Paris, or Detroit demanding Sharia or else. If their demands are denied then they will demand a separatist movement; Chechnya can happen in the West. Islamic separatist movements are alive and well in Chechnya, the Philippines, and other parts of the world. It caused India to split Pakistan away and give it to Muslims, but Islamic terrorism inside India has not stopped. And now Islamists have caught the West in a time of political correctness and multiculturalism. By tolerating hatred and violence, the West is not doing Muslims or Islam a favor. Tolerating intolerance is not a sign of compassion; it is gross negligence. To conclude: Religion, any religion, must adapt to the universal concept of Human Rights, freedom of choice of one’s religion, equal rights of women and minorities. As Arab Americans what are we going to do about it? Are we going to remain silent and defensive? We owe America honest answers. We need to inspire true reform in our culture of origin. There are 7 women in Iran right now awaiting death by stoning — are we going to stand by them or are we going to fail them? Muslim converts out of Islam are in hiding; are we going to allow them to get killed under the name of Islam? Are we going to see the Egyptian Christian population continue to suffer discrimination? If Islam is a religion of peace then we must demand better from our religious leaders. We’ve had it with the self-anointed intolerant Ayatollahs, Mullahs and Sheikhs who act like Allah and silence free speech by issuing fatwas of death. Western feminists must embrace a single standard for both the West and Muslim society. Feminists and everyone else concerned with human freedom must support Muslim dissidents, both male and female, who are risking their lives in a battle for women’s rights under Islam. I ask the support of the American left. You should be our natural allies because we are the reformers and defenders of freedoms in the Middle East. Nonie Darwish is an American of Arab/Moslem origin. A freelance writer and public speaker, she runs the website www.ArabsForIsrael.com. This article was originally published in FrontPage Magazine. Great piece on this brave woman Nonie Darwish. This shows how insane and confused the Left is. They should support women's rights. Apparently, only in the US, not when it is against Muslim women in Muslim countries. ANY group or ideology that is against the West, MUST be loved by the Left;, no matter how despicable, insane and barbaric it is. They are for it, even if it is TOTALLY against everything else the Left has claimed to champion all these years. Mind-boggling insanity. 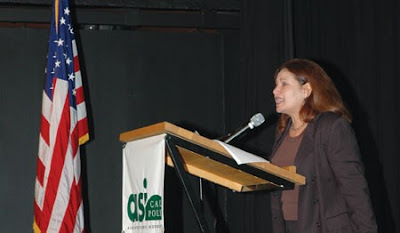 As a part of "Islamofascism Awareness Week", Nonie Darwish spoke at U.C. 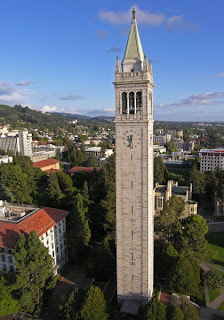 Berkeley on October 22. As usual, Islamofascists and their Dhimmi supporters have shown their unwavering resolve to crush any type of dissent. One the members of the "Students for Justice in Palestine" claimed that the purpose of the "Islamofascism Awareness Week" is to reinvigorate anti-Muslim and anti-Arab campaign. Given the fact that the speaker, Nonie Darwish, is both Muslim by birth and Arab it truly shows the depth of brainwashing on campus. Berkeley, the recipient of The Dhimmi Award.